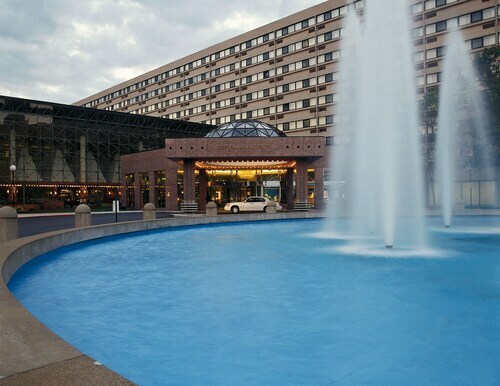 Facing Main Street and the trolley, Hyatt Regency Buffalo / Hotel and Conference Center has direct access to the convention center and is within 3 blocks of Niagara Square and Chippewa Street nightlife. 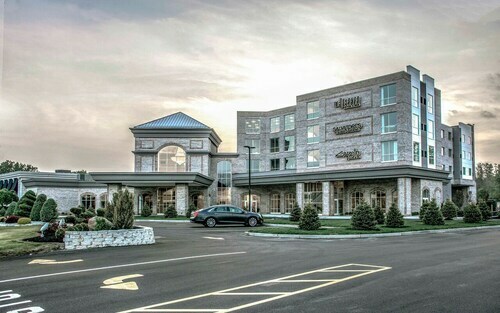 Situated in West Seneca, this hotel is 2.2 mi (3.5 km) from Our Lady of Victory Basilica and 2.3 mi (3.8 km) from Buffalo and Erie County Botanical Gardens. Charles E. Burchfield Nature and Art Center and Past and Present are also within 6 mi (10 km). 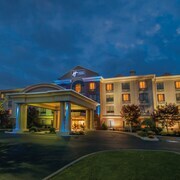 Located 3 miles from the Buffalo airport, this hotel is next to the 200 stores, restaurants, theaters, and shops of Walden Galleria. Situated near the airport, this hotel is within 3 mi (5 km) of Eastern Hills Mall, Diamond Hawk Golf Course, and Samuel’s Grande Manor. Island Park and Glen Falls are also within 6 mi (10 km). 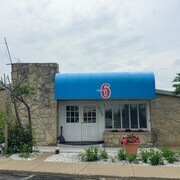 Situated in Williamsville, this motel is within 3 mi (5 km) of Eastern Hills Mall, Samuel’s Grande Manor, and Diamond Hawk Golf Course. Island Park and Glen Falls are also within 6 mi (10 km). 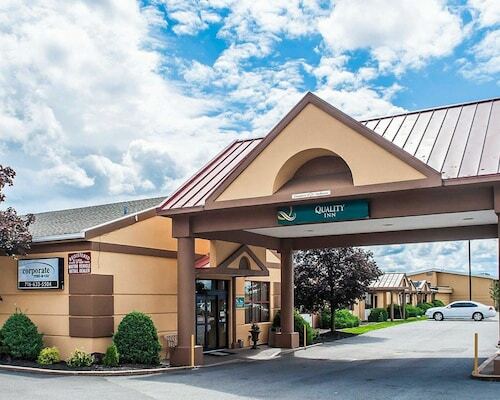 This family-friendly Amherst hotel is located near the airport, within 1 mi (2 km) of Northtown Center at Amherst and University At Buffalo - North Campus. Lasertron and Boulevard Mall are also within 2 mi (3 km). 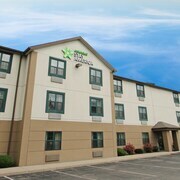 Situated in Cheektowaga, this hotel is 2.8 mi (4.4 km) from Walden Galleria Mall and 3.1 mi (5 km) from Island Park. Holiday Twin Rinks and Glen Falls are also within 6 mi (10 km). Situated near the airport, this hotel is 2.6 mi (4.1 km) from Eastern Hills Mall and 3.1 mi (4.9 km) from Samuel’s Grande Manor. Walden Galleria Mall and Island Park are also within 6 mi (10 km). Located in Downtown Buffalo, this luxury hotel is within a 10-minute walk of Buffalo Niagara Convention Center, Tralf Music Hall, and Shea's Performing Arts Center. Guaranty / Prudential Building and Coca-Cola Field are also within 1 mi (2 km). Fountain Plaza Station is only a 4-minute walk and Lafayette Square Station is 6 minutes. 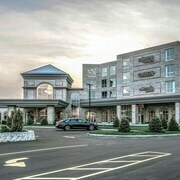 Situated in Williamsville, this hotel is within 3 mi (5 km) of Eastern Hills Mall, Samuel’s Grande Manor, and Diamond Hawk Golf Course. Island Park and Glen Falls are also within 6 mi (10 km). 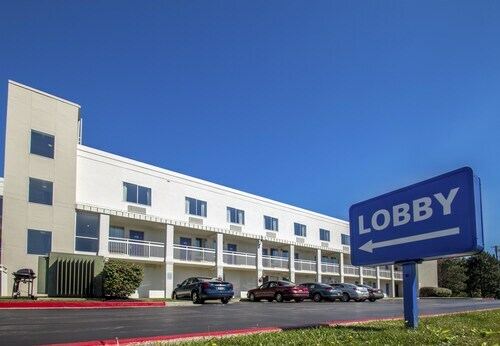 Situated near the airport, this hotel is 3 mi (4.8 km) from Walden Galleria Mall and within 6 mi (10 km) of Island Park and Glen Falls. Eastern Hills Mall and Holiday Twin Rinks are also within 6 mi (10 km). 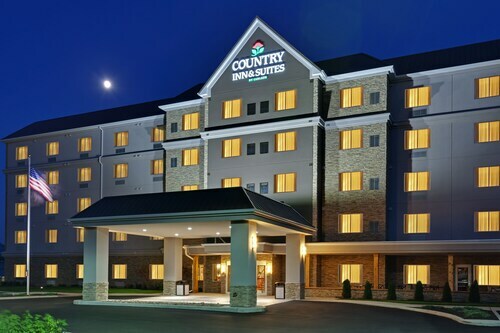 Hotels in Buffalo start at C$67 per night. Prices and availability subject to change. Additional terms may apply. You live in a state of eternal summer, where each day brings new adventures and evenings are infused with energy and fresh flavors. You crave culture and camaraderie dressed in its brightest attire. Spare moments are best spent wandering along historic waterways, perusing stately art galleries, and dipping into coastal comfort foods. So it may come as a surprise that Buffalo, New York—known for its snow-blanketed winters—is brimming with life’s best and brightest experiences in any season. Of course, if a winter wonderland is what you seek, Buffalo hotels and the adventurous city can certainly accommodate. 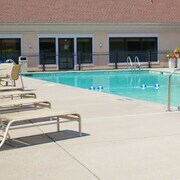 Wondering where to stay in Buffalo? Masterful meetings: The breathtaking ballrooms and numerous banquet halls here combine to form more than 72,000 sq. ft. of meeting space that you can use to host events for up to 2,800 attendees. World-class weddings: Make a splash on your big day by holding your wedding at the Adam’s Mark Buffalo, where impeccable service and a dedicated specialist will make sure everything goes off without a hitch. Healthy and hearty meals: The Harbor Bistro offers a breakfast buffet and a la carte options every morning of the year, while lunch and dinner are available till 10 p.m. And if it’s a sip or snack you seek, the Bistro’s bar is open until 2 a.m. each night. Nearby culture: Interested in seeing a show? Grab a seat at Shea’s Performing Arts Center, which is just a short walk from the hotel’s lobby. Complimentary bites and beverages: Enjoy a free made-to-order breakfast every morning, and score a refreshing drink during evening reception at the Cary Street Café. Exercise options: Get some laps in at the hotel’s indoor pool, or sweat it out at the fitness center, featuring incomparable views of the Buffalo skyline. An event planner’s paradise: Offering more than 6,500 sq. 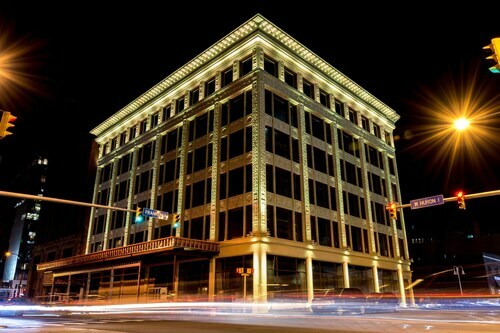 ft. of flexible event space, this is the ideal venue to host events with fewer than 200 attendees. Drinking and dining: With a stop at Twigs Lounge sports bar, you can watch your favorite team on a flat-screen TV. And for more formal occasions, take a table at Walden’s Restaurant, offering terrific views of the tropical courtyard. 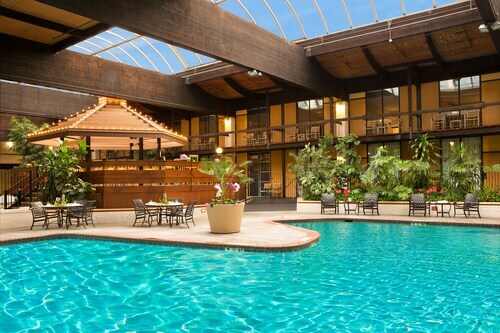 Make a splash: The hotel’s indoor pool makes it easy to unwind or swim some laps at any hour of the day. Events of any size: Offering more than 12,000 sq. 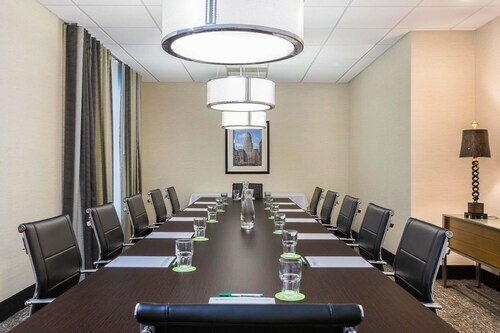 ft. of flexible event space, the Millennium Buffalo has excellent options for hosts of big or small affairs, especially considering how close the hotel is to the airport. Spa services: Seeking for a relaxing escape? Close your eyes and enjoy a personalized massage and customized facial at Spa Alexis. Winning workouts: The Hyatt’s complimentary fitness facility features the latest equipment and is open around the clock, while the hotel’s heated indoor pool on the 11th floor offers unobstructed views of the city’s skyline. Awesome events: Corporate groups love the hotel’s location adjacent to the Buffalo Niagara Convention Center, while the 23,000 sq. ft. of on-site meeting space is more than enough room for most event organizers. Travelocity makes it easy to book cheap hotels in Buffalo during any season of the year. Our selection of Buffalo lodging options is the largest on the web, giving you the power to compare all of your options before deciding which one is best for you. Browse through our catalog of hotels in Buffalo today, and this city could be yours to explore before you know it. The round bar/restaurant was very cool. rooftop bar has a nice view of city and bar staff was friendly. Room was way above average and shower had more jets than an aircraft carrier. Thumbs up on the Curtiss! Very clean. Near Metro. Local shuttle. Good breakfast. Personal and professional service; everyone was very friendly!